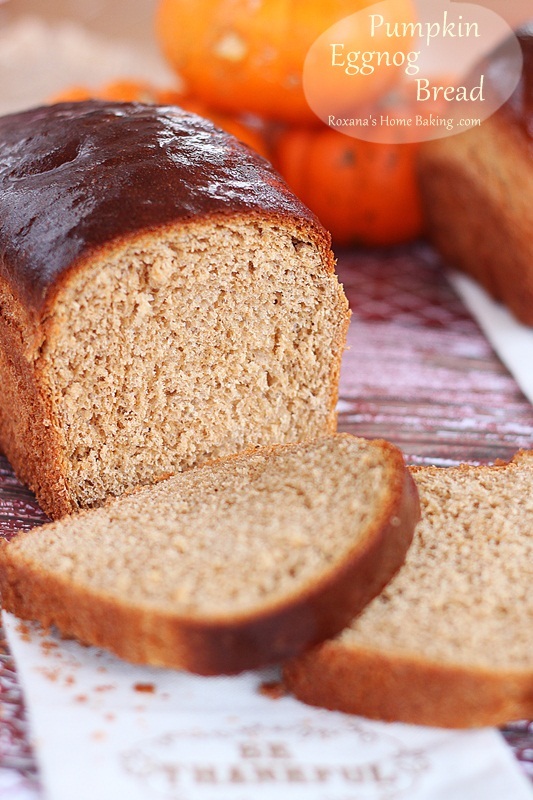 Soft and light, with a buttery crust and a yellowish color, this pumpkin eggnog bread is a wonderful addition to your Thanksgiving meal. I’ve been baking bread for three years now and I’m so happy to have met so many wonderful bakers who inspire me to try new bread techniques or combos. I’m not going to give names since it’s a long list I don’t want to leave anyone one. In my first year of blogging I have stumbled upon Cathy’s blog “Bread Experience” and her monthly “Bake your own bread” event. Some of the month I have sent her some photos and links to the bread recipes I had shared on the blog. Some, I would forget. Last year the bread basket was passed to Heather of “Girlichef” and starting January 2013 I’m happy to announce I’ll be hosting this wonderful event. I can not wait to see what beautiful loaves of bread you’ll be baking. I’ll be creating a new logo and write a page just for this monthly event by the end of the year. Let’s talk Thanksgiving bread now, shall we? I can see some of you with a raised eyebrow : pumpkin eggnog? Isn’t that like Thanksgiving and Christmas in one? Not really? I found at my local grocery store pumpkin eggnog and since I’m a very curious person I bought some. After a little taste testing and a little in my morning coffee I knew I had to bake something with it, but what? Couple of ideas come to mind, some turn into delicious treats, some still need some touch-ups. 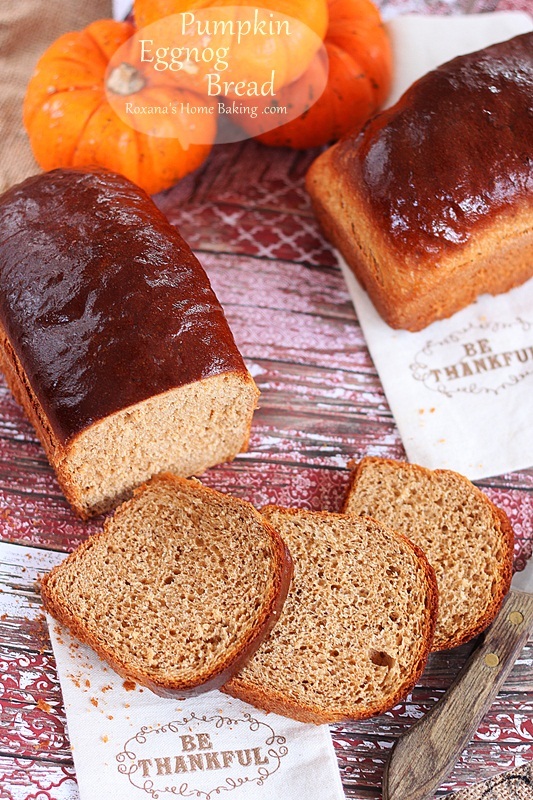 Today we’re talking pumpkin-eggnog bread. I have two other recipes coming this week using the limited edition of eggnog but if you don’t find it I’m pretty sure plain eggnog works just as fine. The bread is not sweet, contrary to what some of you may think since eggnog it’s quite high in sugar, it’s soft, light and with a buttery crust. I’m going to make it again on Wednesday for Thanksgiving since the two loaves I’ve made Saturday are slowly disappearing. 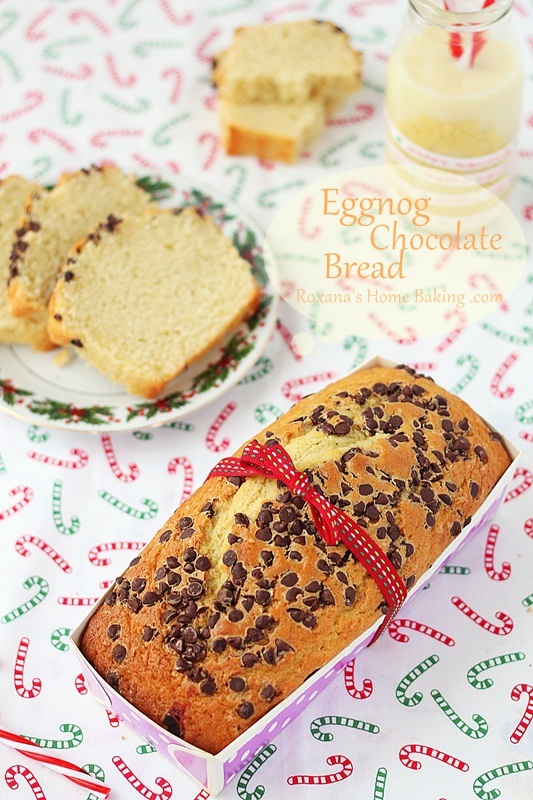 Pumpkin Eggnog Bread - A wonderful holiday bread. Soft, light and with a buttery crust. In a mixing bowl add the flour. Make a well in the middle and add 1/4 cup lukewarm pumpkin eggnog. Sprinkle the dry yeast on top and leave for few minutes until the yeast is dissolved and bubbles appear. Add the pumpkin spice, salt and the two eggs and with the dough hook attachment on start mixing. Slowly add the remaining 3/4 cup pumpkin eggnog and mix until the dough comes clean from the sides of the bowl. Knead for 2-3 more minutes. The dough will be soft but not sticky. Remove the dough from the mixing bowl and place it in a greased bowl, cover with plastic foil and leave at room temperature until doubled in volume. When doubled in size, divide the dough in two and shape each ball into a log. Place each log into a greased 7 inch bread pan, cover with plastic foil and leave until doubled in volume. In the meantime heat the oven at 375F. Bake the loaves of bread for 25-30 minutes. As soon as you remove them form the oven brush the top with the melted butter. If you do not have 7 inch bread pans you can use just one 9 or 10 inch bread pan. 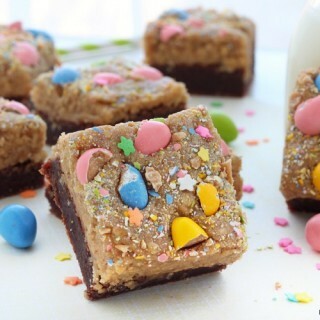 Increase the baking time with 5-7 minutes. I've baked this bread using bread flour instead of white whole wheat flour and added 1/4 cup of flour. It's funny how people are wired so differently. If I were a member of a group like that, it would just mean instant stress. You're such an incredible baker and everything your make comes out so gorgeous and you make it look so easy. Your bread is glorious, Roxana. I love the idea of the pumpkin eggnog flavor and the color it has. I'll bet it's amazing as French toast. How fun and festive is this bread!? Totally awesome! What a gorgeous bread, that crust looks incredible!! 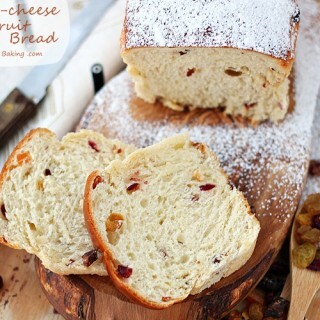 That is the prettiest bread, and the flavors sound beyond amazing! What a beautiful loaf of delishness! They look as though they came from a bakery. Just wish I had a slice right now. Congratulations! You are a wonderful and talented bread baker, and I've learned so much from you throughout the months! You have inspired me to want to start baking my own bread and you have showed me how easy or accessible it is! For that, thank you, Roxana! 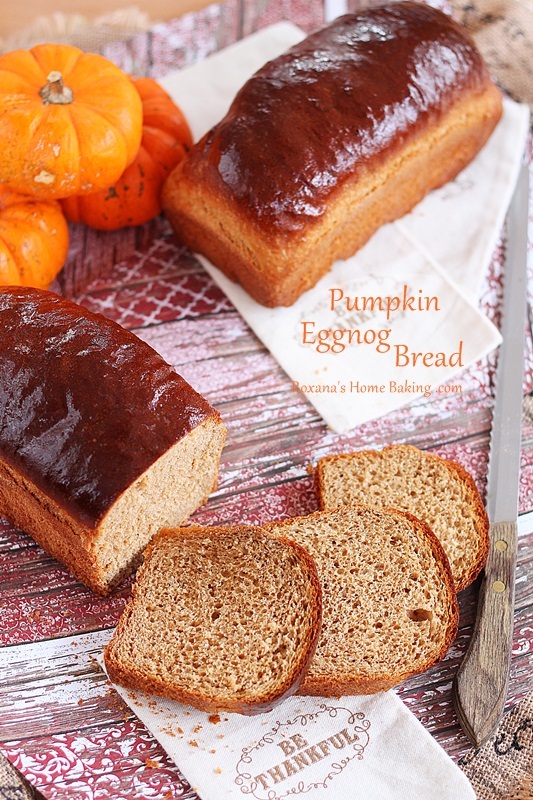 And as usual, your pumpkin eggnog bread is unique and gorgeous! pumpkin eggnog? only in America :) This is a beautiful loaf of bread. I'm in awe of your breadability! This bread is beautiful and incredibly creative! Congratulations on being the new host of #bakeyourownbread! What a creative and delicious bread! 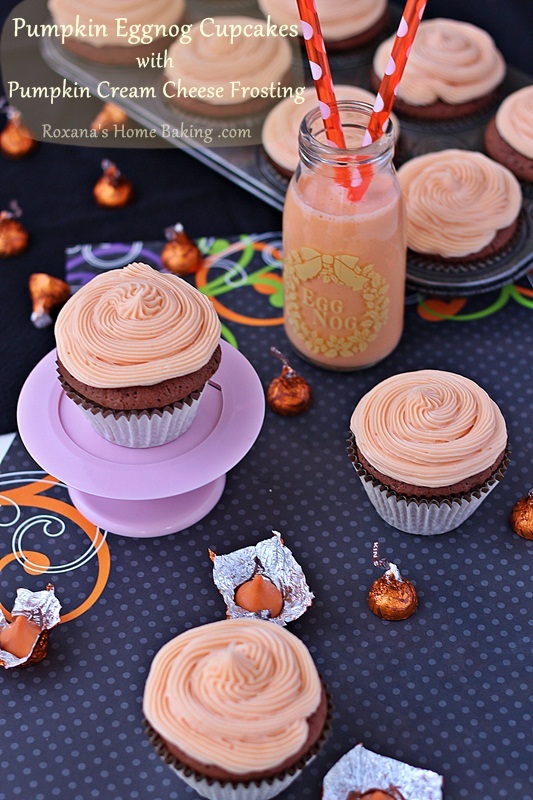 I'm loving all your pumpkin baking recipes, Roxana. Congrats on being chosen as the 2013 BYOB hostess! 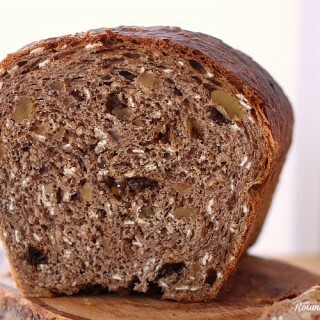 This beautiful loaf and the wonderful flavor combination shows why you're the perfect choice :) Happy Thanksgiving! This looks fabulous! 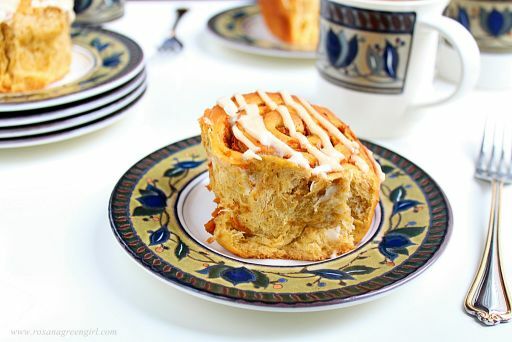 I love anything pumpkin so I'm definitely going to try this.